A cheeseburger and large fries from a Five Guys restaurant is the kind of meal that's taking a bite out of the popularity of the big boys in the burger biz. Quick: What’s the best chain burger in America? This is not a McDonald’s vs. Burger King question. Neither of those chains even made the top 10 in a recent poll of more than 7,000 burger lovers by customer-research firm Market Force Information. The winner was Five Guys Burgers & Fries, followed by California-based regional cult-fave In-N-Out Burger. Rounding out the top five: Fuddruckers, A&W Restaurants, and up-and-comer Smashburger (see chart below for the full list). McDonald’s, Wendy’s, and Burger King clearly aren’t the biggest burger chains because America craves their burgers most. Only two old-time chains, Carl’s Jr. and Wendy’s, managed to sneak into the lower ranks of the top 10 in terms of burger taste. Habit — Many older diners have decades of established patterns of grabbing a McDonald’s burger. They grew up with and trust the McDonald’s brand. Real estate — Diners flock to McDonald’s in large part because with more than 14,000 locations, it’s always nearby. Price — Those $1 menus really bring value-driven customers in. This is the only place McDonald’s scored well in the survey. Advertising — These chains advertise relentlessly, constantly putting their name in front of diners. Over the next couple of decades, much of the advantage will swing to the better-burger upstarts, setting up an increasingly pitched battle for the shrinking value-burger audience. As Five Guys and other quality burger upstarts expand, that may further weaken the position of the old-time burger also-rans. 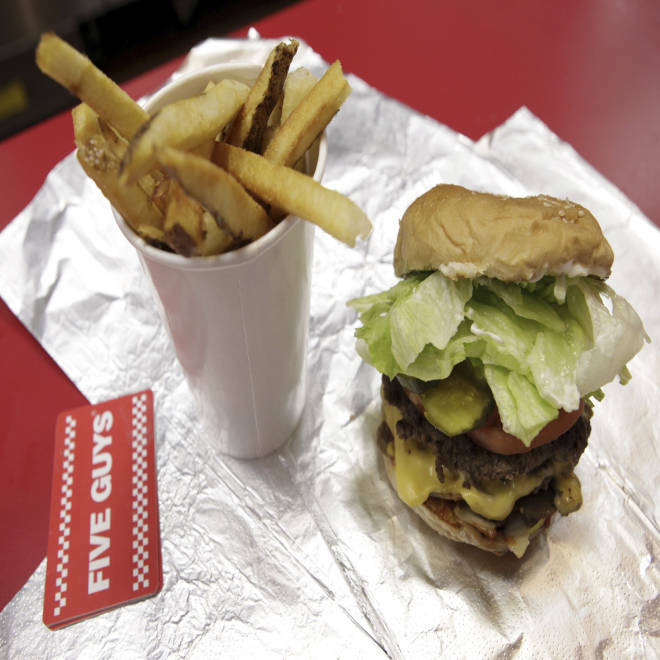 Several of the upstart better-burger chains are growing fast, including Five Guys. Soon, for many diners, a Five Guys or Smashburger might be just as easy to visit as McDonald's. Also, these chains tend to rely, as In-N-Out always has, on word-of-mouth as their primary form of advertising. They cultivate an under-the-radar, cultish fandom rather than trying to be the brand with mass appeal. The lack of big, national TV ad campaigns gives the new chains a distinct cost advantage. Combine that with above-average typical unit sales — Whataburger‘s $1.8 million per unit is higher than any top-10 competitor by sales except McDonald’s — and you have a formula for higher profits. Demographics will also start to catch up with the legacy chains, as older diners die — Hardening of the arteries, perhaps? — and younger diners with less-entrenched burger habits are lured away by burgers made with better-quality ingredients. This could play out a couple of interesting ways for the burger stalwarts. Wendy’s, which has been struggling to join the better-burger niche, could get some traction on its strategic shift and solidify its lead on Burger King, which it passed in sales earlier this year. Or, Burger King, Wendy’s, Jack in the Box and other old-timers could all be casualties as top operator McDonald’s — widely acknowledged as having the best systems in all of franchising, and currently a revenue juggernaut — becomes the last old-time burger chain left standing. One thing’s for sure: With Five Guys and Whataburger already ranking in the top 10 biggest chains with fewer than 1,000 stores, in a few years the discussion could be about who will survive of the better-burger contenders. For now, though, there seems to be plenty of opportunity to simply nibble away at the core audience of the value-burger brands.